SUPERVISION RECEIVED: Intern will work under the direct supervision of the Program Director. *Our normal business hours are Monday to Friday 9:30 am to 5:00 pm (some events may require attendance on weekends or evenings according to programming needs). The focus of the position is to assist in planning and organizing international exchange programs of international visitors coming to the Raleigh area. Our programming interns play a critical part in helping to facilitate these exchanges. Not only will you learn about the visitors and their countries, you will also learn about the abundant resources in the Research Triangle area. This internship allows you to network with people in the community as well as from abroad. In addition, you will develop important office and communication skills. This is a great opportunity to build your resume promote international and cross-cultural understanding. 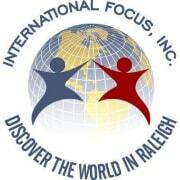 International Focus, Inc. is a nonprofit, membership organization based in Raleigh, N.C. Through facilitating US State Dept funded exchange programs and our flagship event, the International Festival of Raleigh, IF aims to support multiculturalism and diversity within the research triangle area. 5 More opportunities with International Focus, Inc. Flexible 10-15 hours per week depending on intern's work and school schedule.